Before you can assess what stands in your way you need to know where you’re going. What are your objectives? What are you seeking to achieve? Who is responsible for achieving? This includes understanding what the Council wants to achieve and the resources it has available – in both capacity and capability – to deliver. The Council has set out its corporate objectives in the Strategic Plan. Our aim is that risk management fits in with and supports your objectives, which in turn support the objectives of the Council. This link between Council objectives, through departmental or service objectives (and even personal development goals) supported by risk management practices is called the golden thread. When everyone at the Council is pulling in the same direction we will have a much greater chance of being able to achieve our shared goals. Clarifying your objectives will allow a greater understanding of what will stop you achieving those objectives and what opportunities you need to grasp to meet your goals. Setting our your objectives clearly will also reveal links to internal and external stakeholders on whom you will rely as well as other external factors that will impact your objectives. Q: When should I seek to define my objectives? A: The ‘textbook’ answer is that your objectives should always be defined. At any point, you should have a clear understanding of what you are trying to achieve so that you have assurance your work is heading in the right direction. In practice, most workplaces don’t have objectives that change day-to-day so it is likely that an annual consideration alongside your service planning will do the job just fine. However, you should be alert to changes that might impact your objectives – for instance embarking on a major project, moving to a new partnership or a change in political leadership – and consider whether these events create a need to revisit and redefine your objectives. Q: Where can I learn more about defining objectives? A: This guide is not focussed directly on this stage, but since it is such a crucial part of risk management we could not neglect it entirely. There is information on how to set good business objectives provided as part of Service Planning Guidance, or alternatively a quick general overview is available at this link. Continuous risk identification: required to identify new risks, changes to existing risks, including those which become irrelevant over time. Risks must derive from objectives, but this can be any level of objective from corporate to personal. When identifying risks following from objectives, you must avoid falling into the trap of simply restating the objective – look instead for those potential events or circumstances that might prevent or hinder achievement. To provide the best services resources allow Failing to provide the best services resources allow This is simply stating the opposite of the objective. Public are dissatisfied with Council services This is a statement of the potential impact of failing to meet the objective; not in itself a risk. When identifying risk, particularly at a set point such as composing a service plan, you will find it useful to ‘horizon scan’. This involves looking to the medium or even long term endeavouring to provide early warning of potential risks, giving enough time for the service to adopt appropriate response strategies. How and why can it happen? What do we depend upon for our success? What opportunities might arise as circumstances change? Once identified, it is essential that someone owns the risk, taking principal responsibility for monitoring its course and tracking actions in response. Risk ownership is not the same as actually undertaking or being responsible for carrying out actions in response. Rather the role is aimed at ensuring necessary actions take place, otherwise there is a chance management actions may not be completed. Risks need not be owned or managed solely by risk ‘experts’; in fact with the right support everyone in the organisation has the capacity to manage risk. The best risk owner will usually be someone closely involved in delivering the area of the business where the risk arises. Q: When should I seek to identify risks? A: Similar to the issue of objectives, ideally the effective manager is continually alive to risks arising in her service and how those risks develop. However, it is also beneficial to periodically take a fresh look at your risks and when formulating a service plan or embarking on a major new project are both great opportunities to review and evaluate. Q: Do I need to consider *everything* that could happen? A: No. Like all organisations, the Council has limited resources available to manage its risk. Therefore an important part of this exercise is to gain an understanding of the key risks – the ones that pose threats to the achievement of our objectives or unlock significant opportunities – so that we can best focus those resources. Consequently it is perfectly coherent to consciously consider a risk so remote as to be not worth recording; the classic example here is the occasional Freedom of Information requests reported in the press where Councils are asked for their contingency plans for dragon attack or zombie apocalypse. You are not expected to plan for literally every eventuality. It may well prove to be so that the next step – evaluating risks – will also help sharpen your focus. Q: Should I just consider ‘what could go wrong’? A: No. As noted in the definition of risk, a mistake often made is to focus on the ‘negative threat’ aspect and neglect the ‘positive opportunity’. Although the mechanics of this guide deal principally with ‘negative’ risks, it is important that you consider these alongside potential opportunities. You will need both sides to be able to understand and effectively manage your service, as well as to be able to present a full picture of its activity. Q: What if I identify more risks than I can manage? A: Firstly, it may be that many of the risks you have identified are already effectively managed by the day-to-day practice of your business. The next steps – evaluating and treating the risks – will help you in forming a picture of what risks genuinely present a need for ‘extra’ management. Secondly it might be that you have cast the net too wide on horizon scanning. Look again at the risks you have identified and consider, in reality, are they issues that will require attention in the near term or can they be ‘parked’ for another day or until the circumstances described are more likely to arise. Thirdly, if you have considered the risks and still feel overwhelmed you may need to seek further advice – Appendix II of this guide gives some guidance on where you can get more support. Having identified the risk, the next step is its evaluation. How big is the risk you have identified? To what degree should the organisation take action to prevent its occurrence or limit its impact? The first part of this step is to consider the inherent risk you have identified. This means the risk as it exists currently, with no additional measures taken; the ‘business as usual’ position. For this reason – save for exceptional circumstances – the inherent risk will not change once evaluated. In the next step we’ll consider how to control risks and how to re-evaluate risk once those controls are in place. Impact – This is a consideration of how severely the organisation would be effected if the risk transpires. In other words if the forecast event actually happens then what will that do to the organisation? Likelihood – This is a consideration of how likely it is that the risk will occur. In other words the probability that it will materialise and become an event to be managed. At Appendix I are impact and likelihood scales that will help guide your judgement in evaluating a risk. Let’s take an example risk. Leading on from the table above, we’ll use the risk: “A lack of suitably trained and available staff limiting ability to deliver efficient services” and assume we are assessing on behalf of the Council’s Housing Benefits function (note that the examples below are indicative, and not the service’s actual assessment). The exercise here is to imagine what would realistically happen to the Council if your risk were to materialise and become an event. 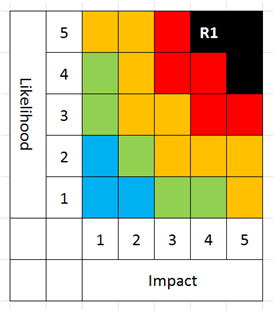 This example therefore gives us an overall risk score of: Impact 4, Likelihood 5. Once you have established a risk score, you will need to plot that score onto the risk matrix which produces an overall risk profile (example below, with the risk just identified shown as R1). To show a representation of movement from inherent to residual risk score (for more details on this, read on). Q – How much do I need to know before I can assess an inherent risk? A - For both elements, the scoring is fundamentally a matter of judgement but you should employ your own experience, past records, expert judgements and wider knowledge to make the process as informed as possible. In general it will not be necessary to undertake any specific additional work at this stage to help identify the inherent risk’s likelihood or impact (such as, commissioning research to help make an impact judgement more specific). However, this might be helpful for certain very high profile risks or where the organisation is embarking on a novel enterprise or approach. If you are finding it difficult to confidently assess an inherent risk then please see the contact details in Appendix II for assistance. Q: Under what sort of circumstances should I reconsider inherent risk? A – The inherent risk is essentially a ‘business as usual’ evaluation; how the risk looks with no special treatment applied. Therefore it may be beneficial to revisit the inherent risk scores if there is a fundamental change to how ‘business as usual’ works, for example a major expansion of the responsibilities of a service or wide-reaching new legislation. Q: If I have a risk with a potential catastrophic (level 5) environmental risk, but only a moderate financial impact (level 3) should I average the overall impact to Major (level 4)? A – Absolutely not. There can be no trade-off of impacts. The organisation has decided that each of the risk impact themes is individually catastrophic/major/moderate &c independently of how they affect other domains. For example, a catastrophic reputational impact is not made more acceptable by the organisation not having suffered a financial loss to get to that point. Your impact score will be equivalent to the highest score you have assessed in any single domain, which will then also act as a guide to where you may best focus your risk treatment (see next section). Q: Do I have to assess a risk against all 6 risk categories? A – No. There will be few, perhaps no, risks you identify that will have a quantifiable impact across all 6. You need only consider against those domains where the risk may impact. Q: Over what period should I consider ‘likelihood’? A – Generally speaking, we mean the possibility of the risk becoming an event within the next 12 months from identification. This is because the process assumes at least one review per year (at the time of producing your service plan) and so you will have the opportunity to revisit the score within a year, although you should ideally review whenever there is a change of circumstances even if a year has not passed. It may be suitable to sometimes consider likelihood over a shorter timescale, for instance risks associated with a particular project that will conclude within a year, so it is best to include in your documentation what period is being considered if not a year. Q: How prescriptive are the impact categories? A – Fundamentally, the evaluation of a risk is an exercise of judgement. The impact categories and levels are there to help guide your judgement and give you an indication of what the Council as a whole considers to be a major impact and so on, but they are not absolute and not intended to cover all circumstances. As evaluation is judgement you may wish within your service to have a review mechanism (for example Head of Service sign off) or evaluate the risks at a team meeting to avoid the possibility of a particularly cautious or even confident individual setting the judgement higher or lower than it should be. Where should I record my actions? TREAT the risk. This is the most common way of managing risks and involves putting in place (or strengthening existing) systems and processes (internal controls). These control the risk and mitigate the likelihood of a risk occurring and/or militate against its impact if it does occur. TOLERATE the risk. This means accepting the likelihood and consequences of a risk occurring. This should only be considered as an option if the risk is within the risk appetite of the organisation, which is to say if it is rated AMBER or (by specific agreement of senior management) RED. Risks rated BLACK are beyond the risk tolerance of the organisation and so this mode of address will not be acceptable except in extreme circumstances. TRANSFER the risk. This means shifting the risk, in whole or part, to a third party. This could be achieved, by example, by seeking insurance to cap financial losses at a certain level or by seeking partners for a project and so sharing the risk. TERMINATE the risk. The means deciding to cease or become involved in the risk situation; withdrawing from the activity which causes the risk. This will not always be possible as the Council must deliver some particular services by law, but will often be an option when considering a new project or opportunity. If you opted to treat or transfer your risk, the next step is to consider the residual risk score. This represents the impact/likelihood of a risk becoming an event once taking into account the additional measures you have taken. Transfer Liaise with [neighbouring authority] to seek share of key staff to provide resilience. Additional cost can be accommodated within service budget. Reduce likelihood of risk materialising to only Probable (score 4) as no information on if [neighbouring authority] is willing to discuss. This example therefore gives us an overall risk score of: Impact 4 (unchanged from inherent risk assessment), Likelihood 2 (down from 5). Note that we have not considered TOLERATE as the inherent risk is beyond the Council’s risk tolerance. Nor have we considered TERMINATE as administration of housing benefits is a statutory service from which the Council cannot withdraw entirely. Note also that we have focussed the above on reducing the likelihood. As this was the highest score in our initial evaluation that’s a good place to start thinking about actions to address the risk, though it may be in reality that other scores are a better focus if they offer more effective solutions. It is important to note the possibility that your risk address actions may themselves cause new risks to emerge. For instance, the proposal in the example above to share services – while a reasonable option to consider – would perhaps be a substantial project in its own right. Once you have established a risk score, you will need to plot that score onto the risk matrix which produces an overall risk profile. Use an arrow to show how your view of the risk has developed as a result of actions planned to address (example below). Q: Where should I focus my treatment of risk? A – A useful approach here will be to consider what factors drove your original assessment of the inherent risk? Is the impact most severe in financial terms? Or reputational terms, perhaps? Consider where you can most efficiently take action to reduce the score of the risk, not forgetting that it is often controls that limit the likelihood of a risk becoming an event that are the most effective. Q: Can I have more than one action for each option to address the risk (for instance two different controls)? A – Of course. In fact, it is probably advisable so that you have back-up plans if for any reason ‘Plan A’ doesn’t deliver the benefits you had hoped. Q: What if I need additional resources to treat risks? A – You should always consider whether your plans to address risk are proportionate to the risk. There is little merit, for instance, in a significantly costly additional control system in order to yield a minor reduction in risk score. However, it will be the case that potential reduction in risks the organisation faces would be a legitimate part of any discussion around resource allocation. For advice and guidance on what might be cost-effective steps to reduce risk please see the contact details in Appendix II. Once you have identified your risks, determined the inherent and (if required) residual risk record this information on the risk register accompanying your service plan or project documentation and send to internal audit using the contact details in appendix II. Internal Audit may have some further questions and discussion before finalising. An example risk register format is at Appendix V and also available as an excel template. Once finalised, Internal Audit will produce a comprehensive list of the Council’s risks, a comprehensive risk register. This register will be updated periodically so please continue to send risk updates to internal audit as they arise. Internal audit will monitor the risk register and periodically request updates, particularly as anticipated actions fall due. Internal audit will also maintain a listing of all BLACK inherent risks plus the top 10 risks across the Council. This summary register will be kept live and updated, and reported to Senior Management each quarter. Twice a year, in January and July, the summary register will also be reported to Members at the Policy and Resources Committee for review. Ongoing failure to provide an adequate service. Perceived as failing authority requiring intervention. Responsible for death. Litigation almost certain and difficult to defend. Breaches of law punishable by imprisonment or significant fines. Uncontrollable financial loss or overspend over £500k. Permanent, major environmental or public helth damage. Failure to deliver Council priorities. Disrupted 5 Days+. Significant adverse national publicity. Fails to prevent death, causes extensive perm injuries or long term sickness. Financial loss or overspend greater than £250k. Long term major public health or environmental incident (1yr+). Service disrupted / stopped 1-2 days. Adverse national publicity or significant adverse local publicity. Fails to prevent extensive, permanent injuries or long term sickness. Litigation expected, but defensible. Breaches of law punishable by fines. Financial loss or overspend greater than £50k. Medium term major public health or environmental incident (up to 1 year). Minor adverse local publicity. Medical treatment required, potential long term injury or sickness. Complaint likely, litigation possible. Breaches of regulations or standards. Financial loss or overspend greater than £10k. Short term public health or environmental incident (weeks). Service disruption up to 1 day. Unlikely to cause adverse publicity. First aid level injuries. Unlikely to cause complaint. Breaches of procedures. Financial loss or overspend under £10k. Environmental incident with no lasting detrimental effect. Almost certain (5) 90%+ Without action is likely to occur; frequent similar occurrences in local government/Council history. Probable (4) 60-90% Strong possibility; similar occurrences known often in local government/Council history. Possible (3) 40-60% Might occur; similar occurrences experienced in local government/Council history. Unlikely (2) 10-40% Not expected; rare but not unheard of occurrence in local government/Council history. Rare (1) 0-10% Very unlikely to occur; no recent similar instances in local government/Council history. Best done in groups, by those responsible for delivering objectives, at all levels. RISK is the chance of something happening that will impact on the objectives. Think what more could go wrong and what more could we achieve? Black - Top risk, immediate action and reporting to directors. Devise contingencies and action plans for 'Red' and 'Black' risks - seek to reduce mitigated risk back to 'Amber' or below.